Last edited by GrayHTRF on Thu Jul 20, 2017 10:34 pm, edited 18 times in total. Nice work on the poster there Gray..looking forward to helping out on the Sunday. Lets hope for plenty of takers, the lanes are looking good!!! It's taken a lot of time and effort from our members to get this off the ground. 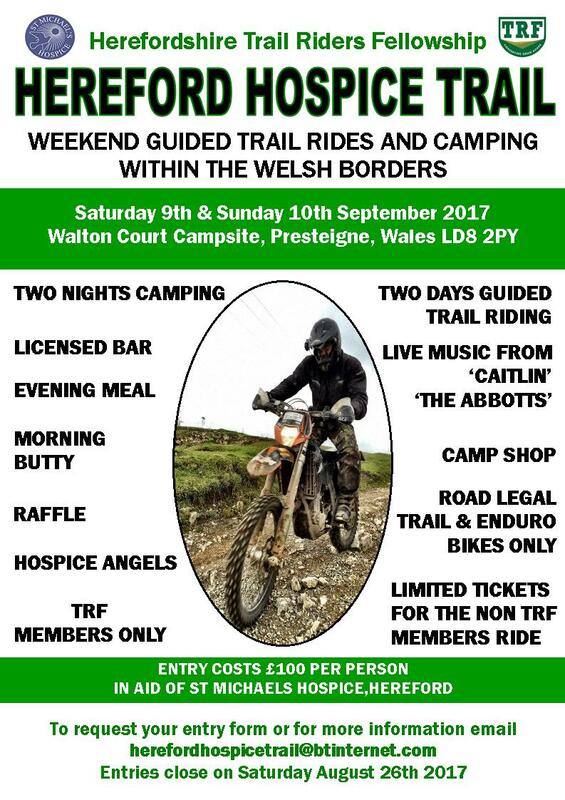 I hope that we will get plenty of entrants for what will be a fun weekend of trail riding and we can then contribute to a very worthy cause the Hereford Hospice. Entertainment,a bar and plenty of banter. What more could you possibly want ! Sorry no dancing girls,but you never know. Great to see another TRF organised event. This will be a weekends riding not to be missed ladies and gents.Also looking very mich forward to having a few beers with you all and putting names to faces. Looking forward to guiding a group round on the Sunday over some stunning landscapes and trails with a great mixture of riding for all abilities. All for a great cause.